 - red footnotes indicate a heads-up for teachers and parents about the title. We cannot foresee every incident that might potentially be an issue to everyone, but we have red-flagged those that are commonly a concern. Continue to use as in previous years with the AmblesideOnline curriculum. The Elements: A Visual Exploration of Every Known Atom in the Universe by Theodore Gray, selected elements ($) Or, purchase the app. Work on drawing skills. Illustrate a scene from one of this week's readings. Begin Latin if you've not started already. Charlotte Mason had students do house or garden work, make Christmas presents, other crafts, sew, cook, learn first aid . . .
4. AO for Groups offers a weekly plan to take students in both Forms III and IV simultaneously through the entire Bible in six years using the same schedule. The schedule is here; it can be printed off as needed and used as a bookmark. 8. The Birth of Britain is Volume 1 of Winston Churchill's 4 volume set, "A History of the English Speaking Peoples." The next three volumes will be used in Forms III and IV. Don't get the one edited by Henry Steele Commager, as it's abridged. For planning purposes, there is a Table of Contents with dates for all 4 volumes of A History of the English Speaking Peoples, and a schedule to break down the week's chapter into 4 short daily readings. 10. The New World is Volume 2 of Winston Churchill's 4 volume set, "A History of the English Speaking Peoples." The next two volumes will be used in Forms III and IV. Don't get the one edited by Henry Steele Commager, as it's abridged. For planning purposes, there is a Table of Contents with dates for all 4 volumes of A History of the English Speaking Peoples, and a schedule to break down the week's chapter into 4 short daily readings. 12. A History of England by Arnold-Forster, online at archive.org, Google Books; a schedule is here. 14. Saints and Heroes is church history. 28. Ourselves: approximately 22 pages per term. This book will continue through all the remaining years of AO curriculum. This is the 4th volume of Mason's 6 Volume Series. This year: pages 1-65 of Book 1. Also available in a modern English paraphrase that can be read online or purchased. (K) The paraphrase of Book I, Self-Knowledge, the first half of Volume 4, can be purchased as a separate paperback book. Use paraphrases cautiously. If a child is truly lost and discouraged, a paraphrase can provide understanding and get him over the hump. But the goal is to build up his reading skills so that he doesn't need a paraphrase, and that won't happen by constantly relying on a paraphrase. 30. Charlotte Mason had students at this level read the daily news and keep a calendar of events. We suggest students choose the most important 2 or 3 stories of the week and re-write them in their own words as a chronicle of the year, making the heading of each page something like "This Week in History, September 1st, 2003." Teachers: pre-read and filter current events materials (on the web, or in print) as necessary, due to the potential for coverage and topics of an explicit nature, even from conservative sources. We've listed some possible options here. Blogs as a media form have rapidly overtaken hard-copy publications. News is being reported there, in some cases, faster and more accurately than other, older media forms. Students should learn about them, find one they trust, and check it regularly. However, we recommend that teachers first become familiar with blogs and visit the one(s) their students will frequent. We suggest several poliblogs here, but know that not every message on these blogs will be 'child-friendly' and often have ads that include scantily clad women. Also, most blogs link to a multitude of other blogs and sites that may not be child-friendly. 38. Easy Grammar Plus: It is not necessary to memorize the prepositions at the start, just write a list of them and explain an easy way to remember most of them, such as "any way a worm can go in relations to two apples," or "any way a swallow can go in relation to two mountains." A parent using this with one child could get by with only the Teacher's Edition since the student workbook is included in it, but multiple students would need their own workbooks. There are about 330 student worksheets in this thick book; expect to do one sheet every day to get through the book in two years. (Purchase from their website or CBD) Easy Grammar Grade 8 Student 180 Daily Teaching Lessons by Wanda Phillips is just as good; it also has the student workbook included in the teacher's edition. Work through Easy Grammar Plus over two years. Students who are moving up to Form 4 and only have a single year in Form will need to work through it quicker. If you prefer, you can use Jensen's Grammar. It goes slowly and step-by-step using a thorough answer key, but is not quite as simple as Easy Grammar Plus. There are 75 lessons, so plan to take two years, doing one lesson per week. Students who need to get through the material in a single year should do two lessons per week. Expect to pay about $30 for the Jensen's text and answer key. The DVD's are not necessary. You will probably find it cheaper at New Leaf Publishing, or other homeschool sellers such as Lamppost Homeschool. 44. First Studies of Plant Life: this book will be continued next year. Planting, growing and observing germinating seeds and plants is necessary to benefit from this book. Also online at Google Books. 49. Signs and Seasons - ch 2 and 3 this year. Both the book and journal are cheaper from CBD. Field work is an integral part of this book. 50. The Lay of the Land: These are stand-alone essays. 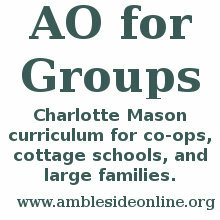 AO scheduled one or two chapters per term to match up with US seasonal months. Feel free to rearrange them to fit the seasons where you live. 52. How to Read a Book: Be sure to get the revised edition. written by both Mortimer J. Adler And Charles Van Doren. If Van Doren is not a co-writer, it's the older book. It was revised in 1972, but later books may not be called "revised." The version to use has five chapters in part 1; 7 chapters in part 2; 7 chapters in part 3; and two chapters in part 4. The unrevised edition may have fewer parts. 60. Charlotte Mason's students were learning three languages at this level. A good English/foreign language dictionary is also recommended.